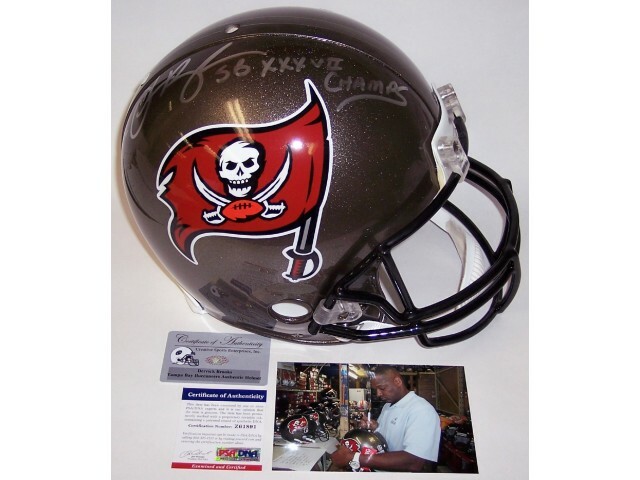 This Tampa Bay Buccaneers Authentic Pro Line Football Helmet has been hand signed by Derrick Brooks. Mr. Brooks added the SB (Super Bowl) XXXVII Champs Inscription. The Helmet will include the PSA/DNA sticker affixed to the helmet, the photo of Derrick Brooks signing our helmets and a Certificate of Authenticity from Creative with matching holograms on the helmet and certificate.